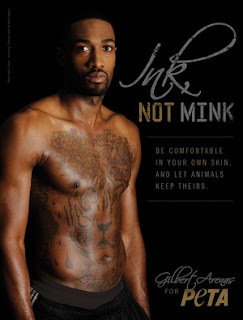 Gilbert Arenas, guard for the Washington Wizards, shows off his tattoos and big guns in the latest PETA anti-fur ad which states, "Be comfortable in your own skin, and let animals keep theirs." The three-time NBA All-Star is the latest athlete to join PETA’s “Ink, Not Mink” campaign. Arenas hopes to spotlight the fur industry’s cruel practices which allow animals to suffer immensely before death. "From the basketball court to the boardroom, from the controversial figure to the style icon, everyone's shunning fur," says PETA Executive Vice President Tracy Reiman. "Arenas shows that you can have a killer look without killing animals. Few industries on the planet are as foul as the fur trade, which bludgeons, electrocutes, and skins animals alive for the sake of vanity."